Let’s face it. It is the longest point until the week-end. 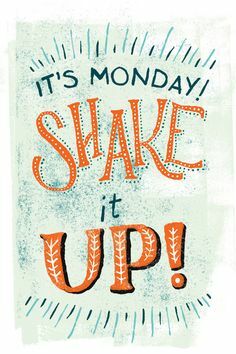 Instead of feeling that weight, I choose to shake it up today. And I don’t mean big time crazy… I mean something simple like trying a new recipe out, clearing my to-do list for this evening and just relaxing. I have accomplished all that I needed today and give myself permission to just be. I am going to pick up those kids and have myself a ‘chill’ evening. Fried calamari for the kids (first timer right here folks), roasted chicken and veggies for the lean eating adults. I’ll let you know how my fist attempt at frying calamari goes… Shake it up!